The book I have chosen features children of many cultures, and is about an emotion that is necessary for us all, especially in the face of natural and humanly-created disasters such as children face the world over. This is perhaps coming at the subject of the day in a rather indirect way, but I hope it can still be seen as appropriate. Opening Sentences: Hope… Sometimes hope feels far away. But hope is always there. The book was written in response to children’s fears after such disasters as 9/11, Hurricane Katrina, the tsunami in Sri Lanka in 2004, and can be used to address other natural and un-natural disasters, as well as serious illness and other fear-producing occurrences. Activities/Resources: Children could be encouraged to think of their own definitions for hope, and to illustrate them either by drawing pictures, or by making collages from magazine pictures and words. They could think of other kids who are perhaps having a hard time feeling hopeful (disadvantaged kids at Christmastime, kids in hospitals, kids whose homes were damaged or destroyed during a hurricane like the recent Sandy) and think of ways to share hope with them. The website Tree of Hope suggests activities such as collages, building hopeful communities, and the like. Sesame Street’s page about helping kids deal with hurricanes could also be used as a springboard for discussion about hope in other situations, and the tips at the bottom of the page could help in talking with children about any situation that arises in which hope is difficult but necessary. Nicky Johnston’s blog My Happy Hero, which focuses on helping children deal with worry and anxiety has useful suggestions, tools, books, etc. that can help in building hope and positivity instead of fear. This sounds like a very beautiful book. Hope is always a theme that should be reviewed and renewed again and again. There can never be too much hope. You are so right. There can never be too much hope. I’m off to the bookstore later today. Great to have your recommendations in hand! Glad to help in a bookstore trip! The text that you have shared is radiant, Beth. What an uplifting, important book! It’s such a simple, yet lovely book, Joanna. I’m glad I happened on it at the library. What a beautiful book, Beth. I love reading about your choices. I know that it will be a book that I can easily share with my young friends. 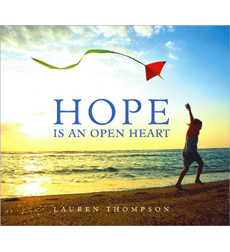 Hope Is An Open Heart is no different. The activities you listed will be great expanded knowledge engagements, too. We may even create our own book of hope with the children’s dictated quotes from their illustrations. Thank you, Beth. I love the idea of the kids creating their own book! Wonderful, Pam. Such a very appropriate selection today with the tragedy that’s occurred in Connecticut this morning. It sounds like a beautiful book that could be used for many situations. I really enjoyed the text you shared. Very inspiring and uplifting. I was horrified by the events in Connecticut — and grateful that I’d shared this book today. Thanks, Pat. Thanks Erik! It’s such a simple, but important message. What a beautiful book, Beth. I have an child who trends towards anxiety and worry. This looks like such a helpful book when we all face such a chaotic world. As someone whose anxiety pattern began in childhood, I can certainly empathize with your little guy, Kirsten. This book would be very helpful, and I think Nicky’s Happy Hero books, like Goodbye Mr. Worrythoughts, would help, too. We could all use a little hope right now, I think. Good choice for today, Beth. I wanted to cry just looking at the cover. Hope is a big word in my limited vocabulary. I often visit people who survive on that one word – Hope. And they do it with strength and grace. It’s a beautiful word and looks like a beautiful book. I’ll have to look for this one. Thanks! Oh Rhythm, what a beautiful comment! Thank you for all you do for those people. You are a treasure. Hope is an amazing commodity. This looks like a beautiful bedside table book. Thank you, Sandi. Yes, it would be so good for those middle of the night worry times that kids and all of us have. I think this book has one of the most beautiful titles I’ve ever heard, and I can’t believe it’s the book you chose for what turned out to be this PPBF. What better choice could there be for all the grieving children in Newtown, CT. And plenty of other situations. Like Julie said, children’s authors are the guardians of childhood. If an author can offer them hope when hey need it most, how amazing is that? It’s important for children to voice their fears, so this book is a perfect choice, especially, as others have mentioned, in light of SandyHook. Thanks for being sensitive to the situation at hand, Beth! Sounds like a great book for kids to help them cope with troubling events.